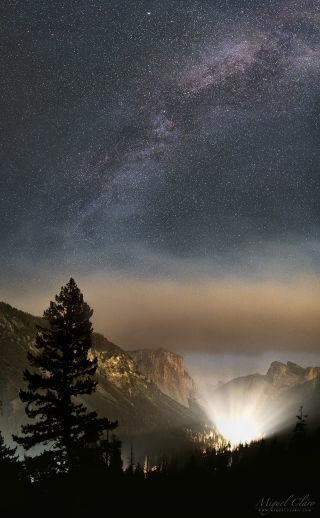 The Milky Way shines above a band of smoke that is visible from the Tunnel View of Yosemite National Park. Miguel Claro is a Lisbon, Portugal-based professional photographer, author and science communicator who creates spectacular images of the night sky. As a European Southern Observatory photo ambassador, a member of The World At Night and the official astrophotographer of the Dark Sky Alqueva Reserve, he specializes in astronomical "Skyscapes" that connect Earth and the night sky. Join him here as he takes us through his photograph "Milky Way from the Tunnel View of Yosemite National Park." The Milky Way galaxy shines over a blanket of smoke in this gorgeous night-sky photo of Yosemite National Park in northern California. Protected by the U.S. government since 1864, Yosemite National Park is best known for its majestic rock formations and waterfalls. Also spread throughout its nearly 1,200 square miles (3,100 square kilometers) are beautiful, deep valleys; lush meadows; and ancient giant sequoias. Within this vast stretch of wilderness, animals live in harmony with the strength of granite, the power of glaciers and the tranquility of the high sierra, demonstrating the persistence of life despite the massive fires that blaze through the area each summer.